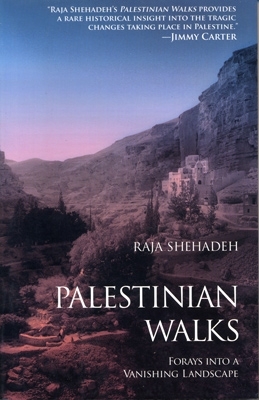 This classic memoir is very hard to find in the U.S.
Raja Shehadeh is a passionate hill walker. He enjoys nothing more than heading out into the countryside that surrounds his home. But in recent years, his hikes have become less than bucolic and sometimes downright dangerous. That is because his home is Ramallah, on the Palestinian West Bank, and the landscape he traverses is now the site of a tense standoff between his fellow Palestinians and settlers newly arrived from Israel. In this original and evocative book, we accompany Raja on six walks taken between 1978 and 2006. The earlier forays are peaceful affairs, allowing our guide to meditate at length on the character of his native land, a terrain of olive trees on terraced hillsides, luxuriant valleys carved by sacred springs, carpets of wild iris and hyacinth, and ancient monasteries built more than a thousand years ago. Shehadeh's love for this magical place saturates his renderings of its history and topography. But latterly, as seemingly endless concrete is poured to build settlements and their surrounding walls, he finds the old trails are now impassable and the countryside he once traversed freely has become contested ground. He is harassed by Israeli border patrols, watches in terror as a young hiking companion picks up an unexploded missile and even, on one occasion when accompanied by his wife, comes under prolonged gunfire. Amid the many and varied tragedies of the Middle East, the loss of a simple pleasure such as the ability to roam the countryside at will may seem a minor matter. But in Palestinian Walks, Raja Shehadeh's elegy for his lost footpaths becomes a heartbreaking metaphor for the deprivations of an entire people estranged from their land.